Bryan Municipal Utilities broke ground for a 14-acre, $7.42 million solar array in early December 2011. By mid-January 2012, all 23,530 solar modules were in place, and the entire 2 MW solar array was generating power on to Bryan’s electrical grid by mid-February 2012. 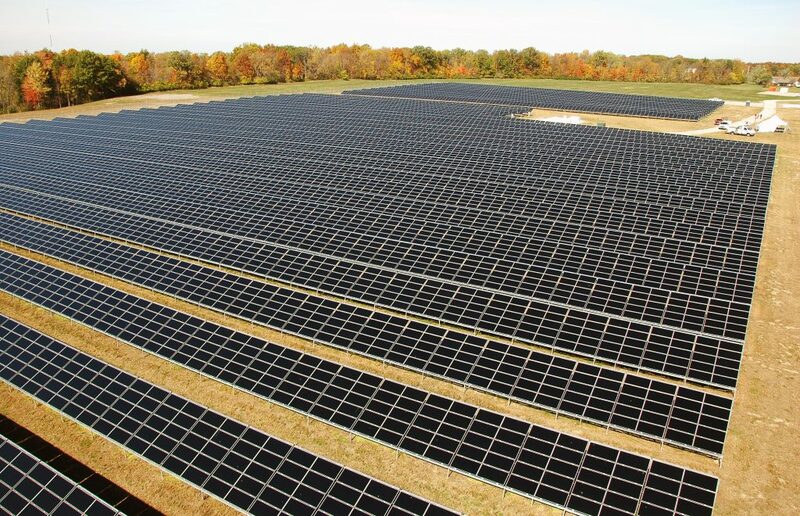 BMU’s solar field is one of the largest solar projects of any public power utility in the state. Primarily Ohio materials, contractors, and labor were used on the project. Rudolph Libbe Inc. of Walbridge, Ohio, designed and built the facility and will operate and maintain it for the first two years. AP Alternatives of Ridgeville Corners made and installed the steel ground-mounted racks for the fixed axis solar array. Bryan electric department constructed power lines to the site and installed switches for the power interconnection. First Solar of Toledo manufactured the solar panels, and Nextronex, of Toledo, manufactured the inverters. Financing was arranged through Key Government Finance, which is leasing the solar array to Bryan Municipal Utilities for 10 years. BMU has the option to purchase the solar equipment at the end of the lease period. The solar array generates more than 2,650,000 kilowatt-hours of clean, renewable energy annually or enough to power 260 average Bryan homes. The system uses the distributed architecture approach, in which all inverters are linked to track at maximum efficiency and extend the life of the equipment. The solar array uses thin-film Cadmium/Telluride modules that produce more electricity and allow energy to be harvested even during low-light hours and cloudy days. The solar array fits with BMU’s power supply strategy. It supplies power during the day when demand for electricity peaks. It also supports the Board of Public Affairs goal for renewable energy. In 2007, the Bryan Board of Public Affairs set a goal of deriving 20 percent of the city’s power from renewable sources by 2015. The utility is on target to meet that goal. 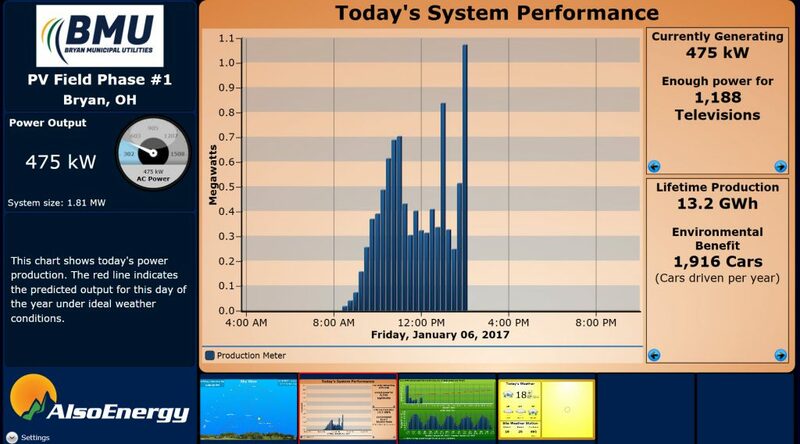 Click the image to the right to link to our online, live kiosk to view current generation and lifetime production.